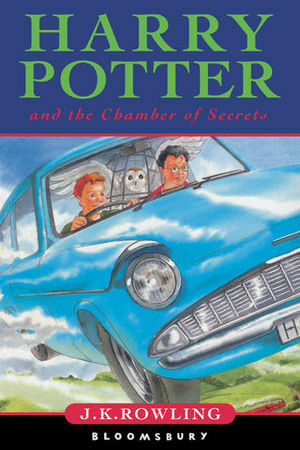 Harry Potter and the Chamber of Secrets, by J. K. Rowling, is the sequel to Harry Potter and the Philosopher's Stone. It is the second book in the series of seven Harry Potter books. The book was published in 1998. A film was theatrically released in November 2002. Her mother being diagnosed with multiple sclerosis,a depression settled over Church Cottage, leaving Rowling feeling trapped and miserable. Escape came in the form of a new pupil at Wydean Comprehensive, Sean Harris, who quickly became a firm friend. In 1982, he drew up outside the family home in his blue Ford Anglia and whisked Jo Rowling away from the grim stillness of Tutshill to the concerts and bars of Bristol. He would park under the Severn Bridge and together the pair dreamt up better futures for each other. Harris’s blue Ford Anglia would become immortalised in Rowling’s fiction as Ron Weasley’s family car and he would be described in the dedication in her second book as "getaway driver and foul weather friend"
And strike it does. For in Harry's second year at Hogwarts, fresh torments and horrors arise, including an outrageously stuck-up new professor and a spirit who haunts the girl's bathroom. But then the real trouble begins - something is attacking Hogwarts students, turning them into stone. Could it be Draco Malfoy, a more poisonous rival than ever? Could it possibly be Hagrid, whose mysterious past reveals dark secrets? Or could it be the one everyone at Hogwarts most suspects ... Harry Potter himself! –Description of Harry's 12th Birthday. Harry has returned to the Dursleys for the summer holiday, and things are very bad for him. Over the summer, the Dursleys had become so fearful of Harry's new-found magical abilities that they had locked away all of Harry's magical supplies (e.g. his wand, his broomstick, spellbooks, etc.) immediately after his arrival home. The Dursleys had also banned Harry from saying words such as "magic" in the house, as evident in Vernon Dursley's outburst at breakfast. On 31 July (Harry's birthday), Harry had never felt so lonely, he missed Hogwarts and his best friends Ron Weasley and Hermione Granger. Neither of them had written to him all summer, not even to send birthday wishes. Aunt Petunia, Dudley, and Uncle Vernon were having a dinner party for one of Vernon's clients, Mr Mason, and Harry had to stay in his room for the night, making no noise and "pretending he doesn't exist". The thing on his bed, a house elf named Dobby, tells Harry that he must not go back to Hogwarts, as it would be dangerous and terrible things are happening there. The elf, however, refuses to tell him what things, and continues to be vague despite Harry's visible anger. In the process, he makes a lot of noise, which is noticed by the group downstairs. Dobby then reveals that he had stopped letters being sent to Harry, and offers them to him if Harry will stay away from Hogwarts. Harry refuses and, in frustration at Harry's refusal, Dobby runs downstairs and uses a Hover Charm to smash the dinner party's pudding. An owl from the Ministry of Magic is promptly received (scaring away Mrs Mason, who is mortally afraid of birds) with a warning saying that Harry has violated the Decree for the Reasonable Restriction of Underage Sorcery, though he is not actually punished (possibly because it is only his first offence). After realising that Harry isn't allowed to do magic outside of Hogwarts grounds, Uncle Vernon locks Harry in his room. Vernon reasons that if Harry uses magic to get himself out, he will be expelled anyway. –Harry Potter, about the Burrow. The Dursleys' punishment lasts for three days, until Ron, Fred, and George Weasley, worried about not hearing from Harry all summer, borrow their father's flying Ford Anglia and come to the rescue. They are able to break the metal bars off Harry's window and help him pick the lock to his door so that he can get his Nimbus 2000 and trunk. The Dursleys discover his escape attempt, but by the time they can intervene, Fred, George, Ron and Harry have got everything of Harry's and have flown away. On the flight to the Burrow, Harry explains Dobby's warning. They all agree that Dobby most likely belongs to the Malfoys who sent Dobby to Harry as a joke. Harry is taken to the Burrow, the Weasleys' home, and he finds the house truly amazing. Since Ron, Fred and George stole the car without permission, they are yelled at by Molly Weasley, who was waiting in the kitchen. After their scolding, she makes them breakfast and has the three Weasley boys (and Harry who volunteered) de-gnome the garden refusing to use a technique from Gilderoy Lockhart's Guide to Household Pests, and do it their own way. Arthur Weasley soon comes home and is honoured to meet Harry after they are introduced to each other. Molly, his wife, yells at him for enchanting the car. Ginny Weasley, who was enrolling at Hogwarts that year, is very obviously enamoured with Harry and spends most of the chapter hiding from him. Harry stays at the Burrow until his departure for Hogwarts. During that period, he and the Weasleys travel to Diagon Alley with Floo powder in order to get their school supplies. Harry has difficulty with the smoke around him and says "Diagon Alley" unclearly, and thus he accidentally lands in a shop in the ill-reputed Knockturn Alley instead. The shop is Borgin and Burkes, specialising in objects related to Dark magic. There he sees Lucius Malfoy, father of Draco Malfoy, Harry's arch rival from school, selling items imbued with Dark magic to a dark arts salesman, Mr Borgin. Malfoy explains that the Ministry has been conducting raids on wizard houses in order to uncover illegal artefacts, so he is selling his more problematic possessions. He also expresses his disdain for a rumoured Muggle Protection Act, which he (rightly) assumes Arthur Weasley is behind. Harry leaves the shop to be found by Hagrid and taken back to Diagon Alley to reunite with the Weasleys and Hermione Granger, who is also there with her parents. In Flourish and Blotts, he and the Weasleys meet the famous wizard/author Gilderoy Lockhart, who announces that he will be taking over as Hogwarts' new Defence Against the Dark Arts teacher. He then forces Harry to have his picture taken with him for the main page of the Daily Prophet. They also meet Draco and Lucius Malfoy there. The elder Malfoy continuously taunts and insults Arthur and his family and eventually Arthur lunges at him. During the fight, Malfoy grabs one of the Weasleys' second-hand books and subsequently throws it back at Ginny in contempt. –Ron, complaining about the Whomping Willow. It is time to return to Hogwarts, Harry and the Weasleys arrives at King's Cross Station on the Ford Anglia, after several delays (Fred and George forgetting their broomsticks, and Ginny forgetting her diary.) On the way to the Hogwarts Express, when Harry and Ron try to go through the barrier to Platform Nine and Three-Quarters after everyone else went through, the barrier mysteriously is sealed against them. Having missed the train, Harry and Ron thus decide to fly Mr Weasley's flying Ford Anglia to Hogwarts. They end up getting spotted by many Muggles and crash into the Whomping Willow, the impact breaking Ron's wand. The giant tree starts pounding the car. The battered car manages to escape, ejecting Harry, Ron, and their luggage, before quickly driving off into the Forbidden Forest. After they make it to the castle, Professor Snape catches the boys and attempts to have them expelled, but fails to convince the headmaster, Professor Albus Dumbledore, who says that he will send a letter to Harry and Ron's families. Still, Professor McGonagall gives a warning and separate detentions to both boys. She also tells them that Ginny had been sorted into Gryffindor, providing them with Endless Sandwiches and disallowing them from attending the Start-of-Term Feast. The next day, Ron receives a Howler from his mother during breakfast in the Great Hall. Then, Minerva McGonagall hands out timetables and the first class is Herbology with the Hufflepuffs. In the class, Professor Sprout teaches how to transplant Mandrake seedlings, which have restorative properties when mature. The next class is Transfiguration, where Ron has problems with his broken wand, even when he repaired it with some Spellotape. Later, the trio have their first lesson with Gilderoy Lockhart, appointed as the new Defence Against the Dark Arts teacher. His way of teachings is a complete disaster. Much to Harry's chagrin, he receives constant attention from Lockhart and Colin Creevey, a first year student. Both constantly interact with him on the base of his fame (Colin treats Harry as a celebrity and Lockhart hopes to actually bring him to that state). –Reaction after Malfoy calls Hermione a Mudblood. The Gryffindor Quidditch team has a very early practice on Saturday morning, where they are treated to an hour-long introduction to a new training program Oliver Wood spent the summer working on. Soon after the actual practice starts, the Slytherin Quidditch team, with new Nimbus 2001 broomsticks, arrives, and an argument over field time ensues. During the confrontation, Malfoy is revealed to be the new Slytherin seeker, and the one responsible for getting the Slytherin team new brooms. Hermione says that nobody on their team had to buy his way in, they made it on pure talent. Malfoy calls Hermione a Mudblood, and Ron tries to curse him. However, his damaged wand causes the curse to backfire and he is rushed to Hagrid's cabin when he starts vomiting slugs. Later, Professor McGonagall assigns Harry and Ron their detentions. Harry is made to help Lockhart answer his fan mail, while Ron polishes the school's prizes and trophies. During his detention, Harry hears a disembodied, sinister voice which Lockhart is unable to hear. –Ron, about the Deathday Party. In return for distracting Argus Filch just when he's about to give Harry severe punishment, Harry promises he will come to Nearly Headless Nick's Deathday Party on Hallowe'en. He brings Ron and Hermione along as well, but the three of them quickly get tired of the ghostly party and return to the Great Hall. Before they get to the Hallowe'en feast, Harry hears the voice (which Ron and Hermione also cannot hear) and follows it to the second floor, where he finds the bathroom flooded and Mrs Norris, Filch's cat, hanging from a torch bracket, petrified and coupled with a message on the wall, reading "THE CHAMBER OF SECRETS HAS BEEN OPENED. ENEMIES OF THE HEIR, BEWARE". Then, students leaving the Hallowe'en Feast surround them. And Malfoy yells: "Enemies of the Heir, beware! You'll be next, Mudbloods!" Filch and Snape try to get Harry in trouble for what happened, but Dumbledore says that it is powerful dark magic that no second year student could perform. They decide that Professor Sprout's mandrakes will be used, once they are mature enough, to create a draught capable of reviving Mrs. Norris. Hermione wants to research the Chamber, so she persuades Professor Binns (the History of Magic teacher) into telling the class about it. He explains that one of the founders of Hogwarts, Salazar Slytherin, got into an argument with the others about whether Muggle-borns should be admitted. When the rift grew too large, he left the school. According to legend, he built a going-away present to the school in the form of a secret chamber that could only be opened by his true heir. This "Chamber of Secrets" contains a monster that only the Heir of Slytherin can control and that, once released, would purge the school of all Muggle-borns. Binns unsuccessfully tries to assure the class that the Chamber does not actually exist and that the school has been searched many times in vain. –Dobby explaining his plans to Harry. Harry, Ron and Hermione decide that the heir is probably Draco Malfoy. To try to prove it, Hermione proposes to use Polyjuice Potion, which can change a person into somebody else for an hour. After getting Lockhart's signature to check out the book Moste Potente Potions from the Restricted Section that has the recipe, Hermione warns them that the potion will take a month to brew, supposing they gather all the necessary ingredients (two of which can only be found in Snape's private inventory). Since no one comes into Moaning Myrtle's bathroom, the three of them decide it is the best place to brew the potion unnoticed. Hermione begins working with the ingredients they have. During the month that it takes the Polyjuice Potion to brew, a Quidditch match between Gryffindor and Slytherin takes place. During the match, one of the Bludgers stakes after Harry and focuses completely on him. Since Bludgers are supposed to attack each and every player, the crowd immediately realises that this Bludger has been tampered with. Harry still manages to catch the Golden Snitch and allow for Gryffindor to win thanks to the Slytherin Seeker Draco Malfoy wasting his time towards insulting Harry and not paying attention to his surroundings where the Snitch was hovering slightly above his left ear. However, prior to catching the Snitch, the Bludger broke Harry's arm, and Lockhart, attempting to fix it, gets rid of all the bones in his arm instead. Madam Pomfrey gives Harry Skele-Gro potion to counter this and Harry is forced to stay in the hospital wing overnight. During that night, Dobby visits Harry and reveals that it was he who made the Bludger chase after Harry, and was also responsible for the barrier of Platform Nine and Three-Quarters not letting him in for in hopes of Harry leaving or never arriving at Hogwarts. He also reveals that the Chamber of Secrets has been opened before and immediately punishes himself, as he is not supposed to reveal anything. After Dobby disappears, Dumbledore, McGonagall, and Madam Pomfrey enter with Colin Creevey, who has also been petrified. He was found with a camera containing film that has been burnt to the melting point. Dumbledore just observes the camera saying, "The Chamber of Secrets has indeed been opened again." –Gilderoy Lockhart, presenting the Duelling Club. After Harry heads to Moaning Myrtle's bathroom the next morning and explains the details he learned from Dobby, Hermione comes up with a plan of Harry and Ron providing a distraction in Potions so she can steal the remaining ingredients for the Polyjuice Potion from Snape's private stores. Shortly afterwards, when McGongall comes around with the sign-up list for the students who will remain in the school during Christmas, learning that Malfoy, Crabbe, and Goyle have signed up, Harry, Ron, and Hermione do this as well, since this gives them the perfect opportunity to use their Polyjuice Potion. With Harry providing a distraction during Potions class by throwing a Filibuster firework into Goyle's cauldron, it creates the necessary disturbance allowing Hermione to succeed without trouble, though Snape still suspects Harry's involvement with this incident after finding the firework. Harry later signs up for a Duelling Club which, to Harry's great displeasure, is taught by his two least favourite teachers, Lockhart and Snape. During a practice battle in the first meeting, Draco Malfoy conjures a snake to attack Harry. Lockhart tries to banish it, but all he manages is to set it loose on the students. Harry sees that the snake is advancing on a Hufflepuff student named Justin Finch-Fletchley and instinctively tells it to stop, which-to Harry's great surprise-it does. He expects Justin to be grateful; on the other hand, he and the others are less than ecstatic about it. All they saw was Harry speaking Parseltongue, the language of snakes, and since they cannot understand it, it seemed to them that he was egging the snake on. Harry learns that Parseltongue is a very rare gift that is closely associated with Salazar Slytherin. Due to this, Harry becomes the number one suspect among students for being the heir of Slytherin. Hermione even tells him that since Salazar Slytherin lived so long ago, he might actually be a descendant. When a Herbology lesson is cancelled, Harry has a talk with Hagrid, who reveals that the school's roosters are being mysteriously killed. Seconds after leaving Hagrid, Harry runs into a petrified Justin Finch-Fletchley and a black, also petrified, Nearly-Headless Nick. Peeves alerts the whole school, and a Hufflepuff student called Ernie Macmillan claims that Harry has been caught red-handed. –Draco, about the Chamber of Secrets. For the first time, Harry is taken to Dumbledore's office, and there he witnesses Fawkes—Dumbledore's phoenix—bursting into ashes and being reborn. Dumbledore says that he does not believe Harry to be behind the attacks, a belief reinforced by Hagrid backing Harry's alibi, but a large portion of the school is now sure that Harry is Slytherin's heir. When Christmas arrives (Harry's gifts: a toothpick, fudge in a tin, a copy of Flying with the Cannons, a new quill, a jumper and plum cake), with the Polyjuice Potion ready and Hermione having acquired some spare Slytherin robes to use (since they can't use their regular clothes while transformed), they give to Crabbe and Goyle two chocolate cakes containing "sleeping pills" that made both Crabbe and Goyle fall asleep once eating the cakes. Harry and Ron take their hairs (and shoes due to Crabbe and Goyle having larger feet) and assume their form. Hermione tries to use a hair she thought belongs to Millicent Bulstrode, but it is actually her cat's hair and Hermione is transformed into a cat/human hybrid. Hermione is forced to spend a few weeks in the hospital wing. As Crabbe and Goyle, once Draco leads them to the Slytherin common room, Harry and Ron interrogate an unsuspecting Malfoy and discover that even though he wishes he were, Draco is not the Heir of Slytherin. They also hear that Lucius Malfoy mentioned that the last time the chamber was opened, fifty years ago, a Muggle-born student died and whoever was responsible was expelled. Malfoy also mentions his father's secret stash of illegal artefacts. Weeks later, Ron and Harry overhear Argus Filch complaining about his workload and leaving. They arrive at Moaning Myrtle's bathroom to find it flooded. Myrtle, a sulking ghost, explains that she had flooded it because somebody flushed a diary down the toilet and onto her. Harry picks it up; he discovers that it once belonged to somebody called T.M. Riddle, but the diary is completely blank. Ron remembers from his detention that Riddle had won an award for special service to the school fifty years before, as he had another slug attack on the trophy. Hermione deduces that since this coincides with the last time the Chamber was opened, Tom Riddle might have received his prize for catching whoever was responsible for the attacks back then. Even though all attempts to extract information from the diary fail, Harry feels a strange compulsion to keep it. On Valentine's Day, Ron and Harry are dismayed to find out Lockhart has spread dwarves dressed as cupids throughout the school to receive and deliver Valentines. One cupid-dwarf manages to deliver one (a singing valentine) to Harry. While struggling to avoid him, the embarrassed Harry trips and falls, having ink spilled all over the contents of his bag. Ginny notices the diary and assumes a horrified expression. Draco Malfoy also tries to steal the diary as Harry is picking up his stuff, but an angered Harry stuns him, ignoring the fact that Percy Weasley was also there trying to handle the situation, which results in Percy reprimanding Harry. Later, Harry realises that even though ink was spilled all over the diary, it is not stained at all. He tries writing to the diary and, to his surprise, T.M. Riddle writes back. Riddle explains that he was the one who caught the person who opened the Chamber of Secrets the last time, and he can show Harry what happened. Harry agrees and gets sucked into a "recording" of Riddle's memory. He witnesses the school's previous headmaster, Armando Dippet, informing Riddle that the school will be closed, since now a Muggle-born girl has died. Riddle, apprehensive of this, catches Hagrid fiddling with a large spider in a box. Riddle reports Hagrid to Dippet. During the memory we also learn that Riddle was an orphan that did not want to go back to the orphanage, and his full name was Tom Marvolo Riddle. Having seen this, Harry wonders whether Hagrid was the one who opened the Chamber fifty years before and whether he is responsible this time. Harry, Ron and Hermione decide not to ask Hagrid about it, hoping that the attacks have stopped-and indeed, almost four months after the attack on Justin and Nearly-Headless Nick, the disembodied voice keeps quiet and the attacks seem to have ceased. However, odd things keep happening: Harry returns to his dormitory one day to find it a mess. Ron deduces that somebody has been looking for something, and Harry eventually notices that Tom Riddle's Diary is gone. This greatly befuddles them, knowing that only a Gryffindor student could know the password to enter the dormitory. The next day, the scheduled Quidditch match between Gryffindor and Hufflepuff is cancelled due to yet another attack and Harry hears the voice again. This time Minerva McGonagall calls for Harry and Ron personally, and leads them to the hospital wing, where they see Hermione petrified. She was found near the library with a Ravenclaw prefect, holding a small, circular mirror. This removes Harry as a suspect in the eyes of many of the students, since he would never attack one of his friends. Harry and Ron decide they now must talk to Hagrid. With the now constant supervision on students, this is not easy, but they manage to do it by using Harry's Invisibility cloak. When they reach Rubeus Hagrid's cabin Harry and Ron manage to hide just before Cornelius Fudge, who is the Minister for Magic, and Dumbledore arrive at the scene. Fudge announces that Hagrid, who to the best of his knowledge opened the Chamber of Secrets the last time, will be sent to Azkaban prison as a precaution. They are shortly joined by Lucius Malfoy, who declares that he and the other governors of Hogwarts have unanimously voted to suspend Dumbledore, despite the obvious logic that this would only worsen the situation. Both Hagrid and Dumbledore give last words. Hagrid says that if anybody wants the truth they should "follow the spiders" and Dumbledore says that he will only truly have left the school when none there remain loyal to him. He also stresses that if anybody at Hogwarts needs help, it will always be available to those who ask for it. –Ron, about Hagrid having an Acromantula. Harry and Ron decide to follow the spiders as per Hagrid's advice after Harry notices the spiders during a Herbology lesson. Walking with Fang as their guide along the trails of the spiders, which are strangely all fleeing Hogwarts, takes them into the Forbidden Forest. Even though Ron is deeply arachnophobic, the fact that Hermione has been petrified and that they may be able to help through this investigation gives him the willpower to go along anyway. There, they encounter Arthur Weasley's car, which had apparently taken to driving through the forest like some sort of wild animal. They eventually meet Aragog, an ageing Acromantula which had been one of Hagrid's pets. Aragog explains that Hagrid is innocent and that the monster who killed the girl 50 years ago was something that most spiders fear, even the giant ones (the reason why every single spider was fleeing Hogwarts). Harry and Ron go to leave, but Aragog halts them, deciding to leave them as dinner for his children. Mr. Weasley's Ford Anglia comes blasting through the layers of spiders, however, and lets the boys and Fang escape. After this, Harry and Ron feel that they have reached dead ends everywhere, until one possible last hope occurs to them. Aragog said that the body of the dead girl was found in a bathroom, and Harry deduces that Moaning Myrtle might have been that victim. Of course, with the school under such security, it will be almost impossible to sneak in the girls' bathroom near where the first attack occurred. –Snape, giving Lockhart a mission. Later that same day, Harry and Ron manage to trick Lockhart - who is leading them to their next class - into letting them go by stroking his ego. Just as they pat themselves on the back, they get caught by Professor McGonagall, and Harry has to make up an excuse - they were going to see Hermione in the hospital wing, where visitors were now barred. They now have to go along to make their story appear convincing, but rather than simply hanging around Hermione's petrified form, this time Harry notices a piece of paper tightly clutched in her hand. This piece of paper reveals what Hermione had found out before she was attacked. She had discovered, based on strong circumstantial evidence, that the monster in the Chamber of Secrets was a basilisk. As a basilisk is a giant snake, thus explaining the mysterious voice that only Harry could hear, as he was able to speak Parseltongue. The Basilisk kills people by looking it in the eye, but no one died, because nobody had looked at its deadly gaze directly. Colin Creevey saw it through his camera, Justin Finch-Fletchley saw it through Nearly-Headless Nick (who was already dead and since he couldn't die "again", he was only petrified), Mrs Norris saw a reflection of it in the waters of the flooded bathroom, and both Hermione and Penelope Clearwater used a mirror to look around corners after Hermione figured things out. There is also a note talking about how the rooster's call is potentially fatal to the Basilisk (which explains Hagrid's roosters having been killed during the year). On the note is also scribbled a single word, "pipes", which means that the serpent moves around through the plumbing (which helps them realise that the entrance to the Chamber of Secrets is in Moaning Mrytle's bathroom). Harry and Ron also hear that Hogwarts will be closed tomorrow. The teachers then force Lockhart to deal with the monster, as he has been claiming he could handle whatever is responsible for the attacks. Looking very crestfallen, he leaves for his room. Harry and Ron decide that if Lockhart is going to deal with the monster they might as well tell him what they know. They go to his room, only to find him frantically planning to run away. When questioned on why such a talented wizard as himself is leaving, Lockhart admits that he is a fraud and that he put Memory Charms on the people who really did the things that he claimed to have done in his books. He then attempts to put a memory charm on Harry and Ron as well, but they manage to disarm him and, under wand threats, take him to Moaning Myrtle's bathroom. Moaning Myrtle explains her death, saying the last thing she saw was a pair of enormous eyes by one of the sinks, the tap of which has never worked. Harry finds a snake carved on the tap and then opens the entrance to the Chamber of Secrets by speaking Parseltongue to it. Harry, Ron and Lockhart slide down a large pipe and find themselves in maze-like tunnels far under the school. Down there, they encounter a snake skin left by the Basilisk. Just then, Lockhart feigns fainting and he steals Ron's wand. Victoriously proclaiming that he will erase Harry and Ron's memories and tell everybody they lost their sanity at the sight of Ginny's mangled body, Lockhart fires. Ron's broken wand causes the charm to backfire, erasing Lockhart's memory and causing a portion of the ceiling to cave in. This traps Harry in the direction of the chamber and Ron in the direction of the castle. Ron has no choice but to stay behind and clear a path through the rocks while Harry continues in search of Ginny. Harry then encounters a wall with stone snakes on it, opens it by speaking Parseltongue and enters the Chamber itself. Harry finds himself standing at the end of a long, dimly lit chamber entering the Chamber of Secrets.]] At the far end, he finds Ginny lying on the ground, pale and cold. He drops his wand and runs to her, trying to get a response from her, but to no avail. He then sees Tom Riddle approaching him and holding Harry's wand. Riddle explains that his presence in the present is due to the fact that he is a memory, which had been preserved in his own diary for fifty years. He then reveals what had happened: Riddle was the one that had opened the Chamber of Secrets fifty years ago and planned to purge the school of Muggle-borns; however, when he learned that the school was going to close down due to the attacks and that Dumbledore (then the Transfiguration teacher) was keeping a closer watch on him, he had no choice but to cease the attacks and frame Hagrid for doing it. He eventually left behind a diary containing the memory of his sixteen-year-old self in hopes that it would, one day, fall into the hands of an unsuspecting victim who would help him finish his work. The diary ends up with Ginny. Riddle had written back sympathetically and Ginny grew to confess her fears, hopes and feelings to him. She essentially poured some of her soul into him, which was exactly what he wanted. He gradually grew more powerful and eventually managed to pour some of his soul back into her, possessing her and using her body to open the Chamber of Secrets, releasing the basilisk that launched the new series of attacks and to write the threatening messages on the walls. However, Ginny became suspicious of the diary and tried to dispose of it by flushing it down the toilet in Moaning Myrtle's bathroom. This is when Harry found it. When Ginny saw Harry with the diary on Valentine's Day, she panicked and worried that Riddle had told Harry about her role in the attacks, so she stole it back from his dormitory. It began taking control of her again, but this time with the intention of killing Harry, so he had Ginny write her own farewell on the wall and come down to wait, luring Harry to the rescue and, consequently, his doom. Needless to say, this means that Tom Marvolo Riddle is in fact Lord Voldemort's real name. He then reveals he is, in fact, a half-blood, and his mother had named him Tom after his Muggle father and Marvolo after his wizard grandfather, a descendant of Salazar Slytherin. He scrambled his name to create a new one, which he knew people would fear when he became the greatest sorcerer in the world. Harry retorts that he must be mistaken, because the greatest sorcerer in the world, as everybody knows, is Albus Dumbledore. Even when Voldemort was at the peak of his power he was afraid of Dumbledore, and now he is barely alive. Riddle replies that Dumbledore has been driven out the castle by the mere memory of him. Harry yells that Dumbledore is not as gone as Riddle seems to believe. In this display of loyalty he summons Fawkes the phoenix to him, who also brings with it the Sorting Hat, both assets that Riddle deems extremely useless. Riddle then summons the Basilisk and commands it to kill Harry. However, Fawkes isn't as defenceless as one might initially think, and pecks out the Basilisk's eyes, thus preventing its gaze from killing. The basilisk can still hear and smell Harry, however, and remains very dangerous, so Harry, in desperation, puts on the Sorting Hat, wishing against hope for help. Instead of an answer, Harry Potter has a heavy sword with a hilt embedded with rubies fall on his head from inside the hat. After several missed strikes from the blinded Basilisk, it strikes again, right at him this time but Harry plunges the sword into the roof of the Basilisk's mouth, killing it. However, one of its poisonous fangs sinks into his arm, injecting a deadly poison. While Riddle gloats over his "win", Harry takes Riddle's diary and plunges the Basilisk fang into the diary. Ink begins pouring out of the book the memory of Riddle is destroyed. Ginny immediately stirs and wakes up. Harry is now moments from death, when Fawkes cries on the wound, and since phoenix tears have incredible healing properties, Harry is instantly cured. Harry and Ginny travel back through the Chamber to find Ron and Lockhart, who has no idea of who or where he is. Harry, Ron, Ginny and Lockhart grab onto Fawkes and fly up the tunnel, out of the Chamber (another phoenix specialty, as they can lift very heavy loads). They return up to the Moaning Myrtle's bathroom, where the Entrance seals shut again, and head to McGonagall's office. –Dobby being freed by Harry. At McGonagall's office, Harry, Ron, and Ginny find Dumbledore, McGonagall, Arthur and Molly Weasley, who are delighted to see them alive. Harry worries that Ginny will get blamed for being the person behind the attacks, but to his great relief Dumbledore rightly deduces that Voldemort is the culprit. After Ginny leaves to get a much-needed rest, Harry and Ron both receive two hundred house points each for Gryffindor and both get an Award for special services to the school, and then Dumbledore asks to speak with Harry alone. Harry expresses his concern that he belonged in Slytherin. Dumbledore reveals that Voldemort transferred some of his powers to Harry when he gave him his scar, explaining his ability to speak Parseltongue. He asks Harry why he thinks the Sorting Hat put him in Gryffindor if he has so many Slytherin qualities, and Harry admits that the only reason it did was because he had asked it to. Dumbledore confirms this and tells Harry that "it is our choices, rather than our abilities, that reveal who we truly are". He points out to the sword Harry had drawn out of the hat - Harry now notices it has Godric Gryffindor's name on it. Dumbledore says that only a true Gryffindor would be able to draw it out. Lucius Malfoy then barges into McGonagall's office, outraged that Dumbledore had returned to the school after being dismissed. Dumbledore calmly responds that the governors had asked him to return once they heard that Arthur Weasley's daughter was attacked. Apparently they had been blackmailed by Malfoy to vote for Dumbledore's dismissal in the first place under Malfoy's threat of cursing their families. Dobby follows Lucius into the room, thus showing that his masters are the Malfoys. Dumbledore and Malfoy have a calm but venomous interchange (respectively), during which Dumbledore and Harry (with the help of Dobby's unspoken hints) essentially expose Lucius sneaking Riddle's diary (one of his illegal artefacts) into Ginny's school things during the fight with Arthur at Flourish and Blotts. This was supposed to frame Ginny for the attacks, with heavy implications on the Muggle Protection Act Arthur Weasley had been suggesting. Malfoy dares Dumbledore to prove his accusation, and while the Headmaster has insufficient evidence to do that, he cautions Malfoy against orchestrating any further such plots, otherwise he is certain that Arthur Weasley would do whatever it took to trace it back to Malfoy. Knowing that a master can release his house-elf by giving them some clothes, Harry tricks Malfoy into freeing Dobby by giving Malfoy one of his own socks, which he promptly throws away to be caught by Dobby. Malfoy's retribution is thwarted by the now free Dobby, who then thanks Harry profusely and disappears. The petrified people are cured, Hagrid is released from Azkaban, Lockhart is sent to a hospital and Lucius Malfoy is fired from his post as school governor. The book ends with Harry at King's Cross, crossing the barrier back to the Muggle world. On the front cover of the spanish edition of Harry Potter and the Chamber of Secrets, Harry is holding the sword and looking at the Basilisk, but looking into a Basilisk's eye's is fatal, so, technically, Harry should be dead on the spanish front cover. However with Fawkes having clawed out the Basilisk's eyes, Harry would be able to look on without fear of death. RUMORS: Many fans noted that Dumbledore said that Voldemort was the last remaining ancestor of Salazar Slytherin, instead of descendant. J. K. Rowling said this was a "deliberate mistake". This could support the theory that time travel will recur in the series (see "Rumour" note for Harry Potter and the Prisoner of Azkaban). This mistake was fixed on further printings, though, so it's more likely to be a mistake that slipped past the editors than an actual hint. Some versions have put it back after Rowling's comment, perhaps overlooking the tongue-in-cheek nature of the term "deliberate mistake". This line was left out of the film. The book was also adapted into a film, the second Harry Potter film of the series. The movie Harry Potter and the Chamber of Secrets was released on November 15th, 2002. It was directed by Chris Columbus and the trio was starred by Daniel Radcliffe, Rupert Grint and Emma Watson. This page was last edited on 22 July 2015, at 17:54. This text is available under the GNU FDL and may have been adapted from the Wikipedia article about Harry Potter and the Chamber of Secrets (history).